[Press Release] Cabinetta is now part of JOYA's modern lineup. Saturday, July 23, 2016 — Estelí, Nicaragua – JOYA DE NICARAGUA REBRANDS ITS ACCLAIMED AND UNCONVENTIONAL CABINETTA. Joya de Nicaragua Cabinetta Serie is a crowd favorite around the globe. Its unconventional two toned wrappers or Doble Capa, makes it very attractive to the eye. However, its creamy smoke with peppery notes and mild to medium strength is what keeps captivating consumers. To put the Cabinetta back in the spotlight, as well as to establish it as one of the top signature mild smokes in the US, JDN has revamped its image and migrated Cabinetta under the new JOYA brand name and portfolio. “Cabinetta might be one of the favorite cigars of the JDN team. It’s a brand that we have always enjoyed, specially paired with a hot cup of Nicaraguan coffee. We wanted to give some love back to it, not only by revamping its packaging, but also, by giving it a new identity. We are sure the new Joya Cabinetta will help us expand our offering to modern smokers while continuing to satisfy the needs of retailers and consumers seeking for flavorful experiences without aggressive strength” Juan Martínez, President of Joya de Nicaragua, said. “Besides improving its packaging, we will also release 3 new sizes into the market. But most importantly, we followed our customers’ requests to increase the length of the Doble Capa by almost an inch. Previously, consumers had the unique opportunity of smoking a mild blend while also tasting spicier notes from the criollo wrapper tip from contact with their lips. Some were adventurous and smoked to the nub to actually taste some of the criollo wrapper on the tip. With the new Cabinetta, reaching and experiencing that wrapper change will be easier, which makes it even more enjoyable.” Mario Perez, Commercial Manager of Joya de Nicaragua, said. Since the release of the first JOYA line, the brand has quickly gained popularity among consumers due to its friendlier blends and contemporary design. Cabinetta (Mild) will continue to spread the message of JOYA, one that is full of energy and excitement and will complement the portfolio together with Joya Red (Medium) and its newest addition, Joya Black (Medium). JOYA CABINETTA will be presented to all retail shops during the upcoming IPCPR 84th Annual Convention and Trade Show in Las Vegas in July 2016. Initial shipments will be available at the retail stores by late August 2016. Drew Estate will distribute the brand in the USA as part of our exclusive agreement. Joya Cabinetta will also be available worldwide through our International Marketing Division and JDN’s partners. Fans of Joya Cabinetta are encouraged to download Drew Diplomat the official mobile application of Joya de Nicaragua which is now available in the App Store for iPhone®, and iPod Touch® and on Google Play™ for Android™. For more information head to drewdiplomat.com. 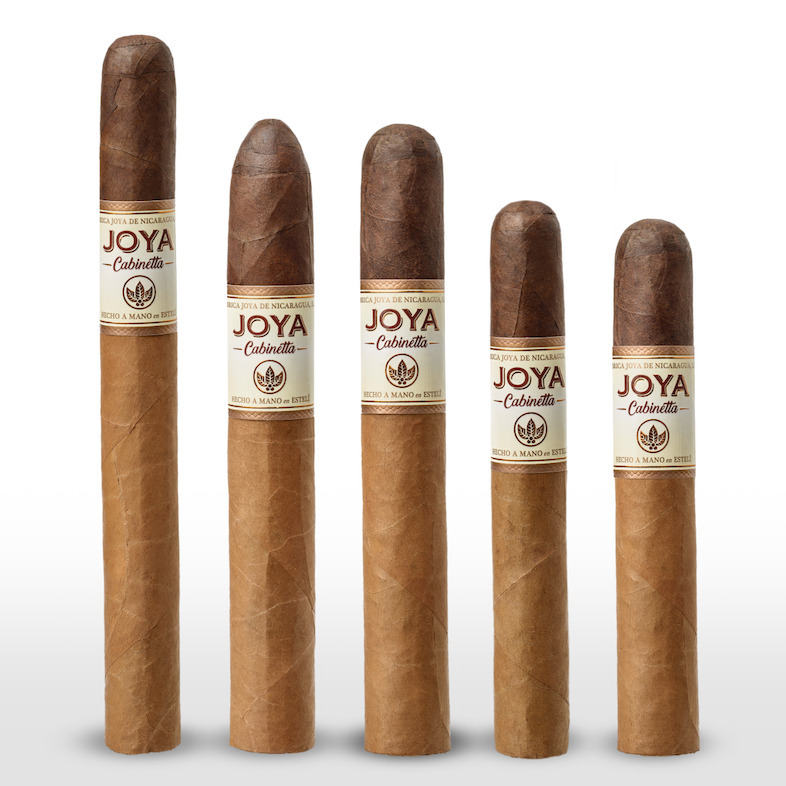 About JOYA DE NICARAGUA S.A.
JOYA DE NICARAGUA S.A., is a family owned, Nicaragua-based cigar factory that handcrafts traditional cigars for the premium luxury cigar market. Founded in 1968, it is Nicaragua’s oldest cigar factory in operation and home to the legendary JOYA DE NICARAGUA® brand of cigars. JDN is regarded by many as the patriarch crafter of robust, unique puro blends of locally grown black tobaccos, and its cigars are sold in more than 43 countries around the world. For more information, please visit www.joyacigars.com. I smoke the Lancero but I don't see it listed. Hope they didn't discontinue it.